CLEVELAND (AP) — For more than three years, the Browns have only tripped on the road. Cleveland hasn’t won an away game since Oct. 11, 2015, a losing streak that has reached 25 straight — just one shy of the NFL record for road futility held by the Detroit Lions (2007-10). As the Browns prepared for Sunday’s game in Cincinnati against the Bengals (5-5), and a clumsy reunion with fired former coach Hue Jackson, interim coach Gregg Williams delivered a specific message to his players about the losing streak. The Browns (3-6-1) have dropped all four road games so far this season, but two came in overtime and another could have gone to OT. In Week 2, the Browns lost 21-18 at New Orleans, a defeat that still stings but looks more impressive now given how well the Saints are playing. Despite perfect indoor conditions, Cleveland’s Zane Gonzalez missed four kicks that day, including a 52-yard field goal at the end of regulation that would have forced OT. The Browns cut him the following day. Two weeks later, the Browns fell 45-42 in OT at Oakland, which benefited from two questionable calls going the Raiders’ way in the second half. 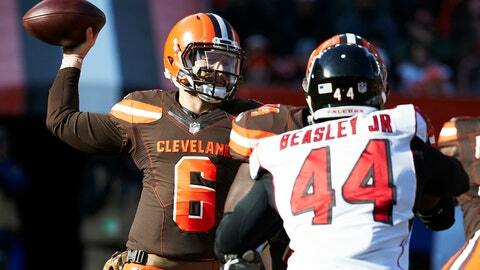 And on Oct. 21, Cleveland got beat 26-23 at Tampa Bay, losing on a 59-yard field goal late in overtime. Those close calls have the Browns convinced their road woes will soon hit a dead end. Safety Damarious Randall believes it will happen Sunday. Randall spiced up this week’s matchup by essentially guaranteeing a Cleveland win Friday when he was asked about facing Bengals star wide receiver A.J. Green, who is questionable with a toe injury. The battle of Ohio is almost always interesting, and the Browns go into it with some momentum following their best all-around performance in a win over Atlanta on Nov. 11 and a bye week. The Browns are healthy and hungry. They’re certainly starved for a road win. Josh McCown was Cleveland’s quarterback for that long-ago road win in 2015, a 33-30 OT shootout in Baltimore. And if the Browns have designs on becoming a legitimate playoff contender, they need to win anywhere, at any time. Rookie quarterback Baker Mayfield has the Browns and their fans feeling the worst is over. Mayfield, who threw three TD passes against the Falcons, hasn’t experienced a road win in the NFL yet, but he orchestrated plenty at Oklahoma. But Mayfield, who snapped Cleveland’s 19-game winless streak in his pro debut earlier this season, said going into New Orleans or Pittsburgh or Cincinnati to play is very different than visiting a campus in Stillwater or Waco. NOTES: The fiery Williams joked that coaching wasn’t always his goal. “I thought about being a doctor, but everybody was worried about my bedside manner, so I became a coach.” … TE David Njoku (knee) and C JC Tretter (ankle) are questionable for Sunday. … Williams wouldn’t disclose his starting left tackle, but it appears Greg Robinson will make his third straight start. Rookie Desmond Harrison started Cleveland’s first eight games.